What should you first study when you start French? What’s the best French curriculum for beginners? What’s the best sequence to learning French? Here is my list. The other day, Oliver Gee from the Earful Tower interviewed me on “how to start French”. You can ear our conversation and the tips I gave him on his podcast here. I figured I had even more tips to share with beginner students of French. I also wanted to give you a clear list of what French grammar and vocabulary points should be studied first, in other words, the priorities and organisations of topics to learn French. 1 – Starting to learn French: school student or self-student? When it comes to starting to learn French, a student enrolled in a French school and self French learner are not necessarily going to have the same priorities. If you are starting French on your own, you need to first assess your priorities. Why do you want to learn French? Is-it to travel to France and communicate with the French? To write songs or poems in French? To read French literature in French? Your approach should not be the same whether the focus is on speaking or reading or writing French. If you are studying school in French, your teacher should provide a French curriculum. Whether it will teach you French or not, that’s what you need to study to ace the class. Introduction to Passé-composé and soon after Imparfait, futur… more French verb conjugations. All mixed with some useful vocabulary and written dialogues introducing a lot of new words each time. The progression is super fast. These methods assume you know or remember what a subject, a pronoun, an adjective or a direct object are. They make you memorize a ton of new info, as if it was the most natural thing in the world. There is almost no repetition: each chapter comes with its mountain of new words, expressions, grammatical rules and conjugations to memorize. First thing, if you are studying French to communicate in French, you must study with audio. It’s extremely unlikely you will achieve a decent French pronunciation if you are studying French only with books since spoken and written French are so different. but also modern spoken French. I’m not talking about a slang street language here, but just the natural way the French speak French in their daily life – the pronunciation is quite different than when they enunciate. You need to understand both enunciated French, and the more natural daily life spoken French if you are to communicate effectively with the French. Watch-out! Most methods only feature the slow enunciated French pronunciation! Then students don’t understand the French when they speak! The next thing to do is to prioritize. You cannot learn everything at once. With so many free tools to learn French, it’s really easy to jump for one funny video to the next and learn bits here and bits there but lack a solid path to link and hold your new French knowledge. To start French efficiently, you need a structure. A beginner French method that will cover the basic French vocabulary and grammatical tenses, teach you daily French vocabulary and the right pronunciation. Stay in the present tense. French conjugations are overwhelming. Yes, they are an important part of the French language, but the tense you will use the most in everyday interactions is the present tense. You need to start somewhere. Start with the present tense and only the present tense. It’s already a lot. You’ll use your verbs as much in the affirmative as in the negative. You may understand the logic, but you need to drill to get it fast when you speak! Repeat, repeat, repeat! Food. Travels. Family. Weather. Work & Hobbies. These are among the most common topics of conversations. Health also but maybe you’re not going to discuss your health right away with a friendly waiter, hein… So, aim for the likely conversations that are relevant to your life, and learn that vocabulary. Questions are the base of communication. If you can’t ask/understand a question, you cannot communicate. There are many ways of asking questions in French. Start with the simpler one, which I call “street French” in my French audiobooks. It’s not really grammatically correct, but it’s the one the French use in their daily life. And it’s simple and to the point. As a beginner in French, there are many things to study. You will feel you progress fast because each new word, each new topic opens up a world of opportunity. But if you are not careful about how you organize the info, you won’t learn efficiently: you will soon forget things, and the logic of French won’t fall into place, and everything will crumble. You need to slow down, follow a method and study efficiently. I’ve been teaching French to adult English speakers for over 20 years. Here is the most logical gradual approach to start learning French for a total beginner English speaking student. 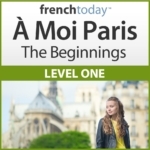 This is what you’ll learn in the first audiobook of my gradual French learning method: À Moi Paris level 1, the Beginnings. As stated above, the vocabulary priorities are up to you. And of course, my French learning method will teach you a lot of vocabulary as well since all the rules are illustrated by a fun, level-adapted novel. But here are the French rules I recommend you study when you start your French journey. Plural subject pronouns – nous, vous, ils, elles watch out the “s” are silent! Asking “and you” is essential – never forget it. Verbs in ER + consonant – Pronunciation only. That’s the most important thing! Irregular plural – OK, but they are less common than regular ones! Making a verb negative. Why can’t I hear this “ne”? What happens when 2 verbs follow each other ? The infinitive construction and lack of “to”. The many ways to tell the time – understand them all. Pick one to use yourself. Now that you have a solid organization and understanding of the basis of the language, you can start filling up the filing cabinet that’s your brain. Load up words of vocabulary, verb conjugations (in the present tense only, hein! You don’t know the rules which govern the other tenses yet!) Learn idioms too, they are fun. Watch out: your French pronunciation is still fresh… you need to know how to pronounce a word before you memorize it. So learning everything, including verbs, with audio is a must. Check out the next level of my French learning method. 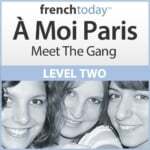 “À Moi Paris level 2, Meet the Gang” features a longer story (still in the present tense), lots of vocabulary and idiom lists, verb conjugations and a Q&A sections so you can practice out-loud. And if you are learning French to communicate, then you need to practice. There is a huge psychological fear to get over when you start speaking a language. You won’t be able to present the real you: you can’t yet be smart, you can’t yet be funny. You will make mistakes. Sometimes, people may laugh at them… These are things you want to get used to: they are part of your French journey. So, I recommend you find a tutor to practice with. Here again, choosing a professional who can guide you, check your pronunciation, encourage you without pressuring you is the key. There are many ways to do lessons exchanges or conversations with a native, but I believe they can be more harmful than anything else for a beginner. You need your emerging self-confidence in French cherished, not crushed by someone who will correct all your mistakes (without offering any explanations for them…) mock you or be impatient. Go for a professional French teacher by Skype, ask for a trial lesson before committing to more to see if you like the teacher. There is a right and a wrong way to start French. If you start French the right way, the smart way, I promise you will feel empowered and start speaking French in no time.